The last time I sent a Christmas card was 2007, which was the last year my ex and I were together. Moving out in December of 2008, there was little thought of creating a Christmas card. Without his name or image on the card, I may as well have called it my divorce announcement rather than a Christmas card. 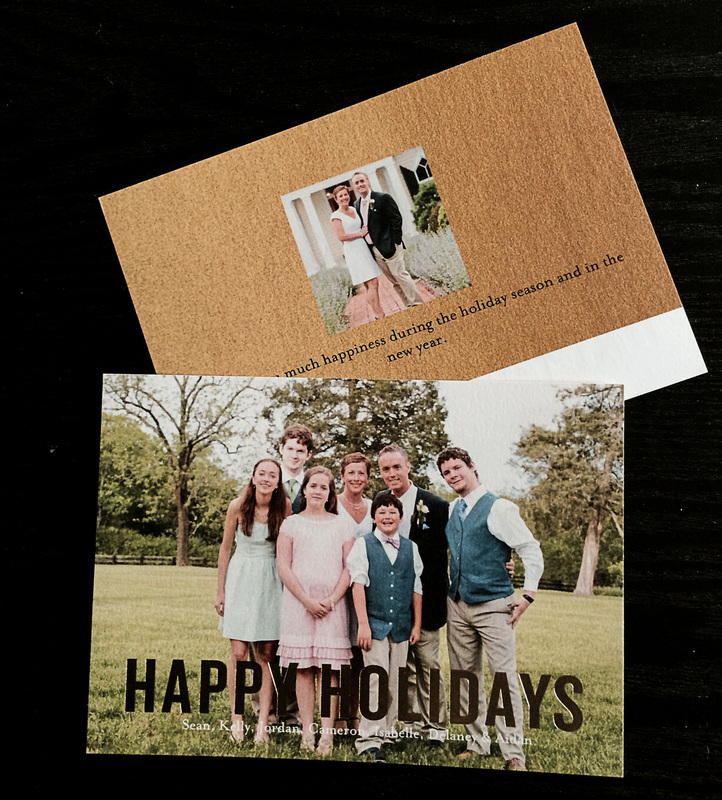 The first few years following the split, a Christmas card felt like printed proof we were broken. I didn’t feel like we were a family anymore; I was just a single mom with her kids. The deluge of cards delivered from families with happy notes and lots of love captured in the images just added to my feelings of familial inadequacy. There were years when I made an attempt. I would photograph the kids, thinking this is the year I will order. And yet, it never happened. For some reason, no matter how much better I felt about our family status, I was stuck when it came to taking the step of sending Christmas wishes from our family. If anyone had been with me two weeks ago when I opened the bright orange Shutterfly box, they would have laughed at me. Or thought I was crazy. Who cries, looking at their Christmas card? I did because no matter how good I felt in my single life, I just couldn’t order cards. It’s the piece that never fell into place. Six years later and newly married, I am sending out my first card since 2007. Finally. What has been difficult for you over the years during the holiday season? For the most part being single at Christmas doesn’t bother me. Except for when I’m doing my Christmas shopping. I see families together with their children looking so happy, I feel my singleness more. Of course even when I was married, I still had to do the shopping alone. His spare time was never for his family, only his friends. We all have something, don’t we Vanessa? I am glad for the most part, Christmas is a happy time for you. It was for me as well…except for the card issue. That is a sweet story. Always nice to hear a happy ending. I love that you got your happy ending with Sean, I was rooting for you guys all along! Can’t wait to catch up and see what else I’ve missed! New Husband, new business… get it girl! Part of me wants to go back a few years and shake you and tell you to just do the cards, because everyone already knows and loves you and your kiddies, regardless. But, I get it. It’s just another one of so many little pieces of “I/we failed,” blah blah blah. No. You didn’t fail. You lived. And this year, you were ready at last to share that one piece of holiday fluff that until now held you at bay. One of the things about divorce and post-divorce rebirth is that only you know how big something like this really is. Congratulations, friend. See? Live really DOES go on, doesn’t it? Thanks, Joe. Yes, life does go on. And what I learned is that you never know how much happiness can be waiting for you just around another bend in the road you are traveling on. Awww, I love this. I’m so happy that you found your happy. And having followed along for the journey, it’s wonderful to hear how you’ve dusted yourself off from that divorce and started a beautiful life with your handsome hubby. Wishing you all the best for a happy and healthy 2015, my sweet. XOXO!!! Thank you so much Charlotte! I am honored you followed along with me on my journey….thanks for always visiting, reading, and supporting me.